This portrait was painted following the passing of Kirsty Harvey, who lost her battle with Cyctic Fibrosis on 26th May 2018 and is fondly missed by her husband Dougie Harvey and her loving family and friends. 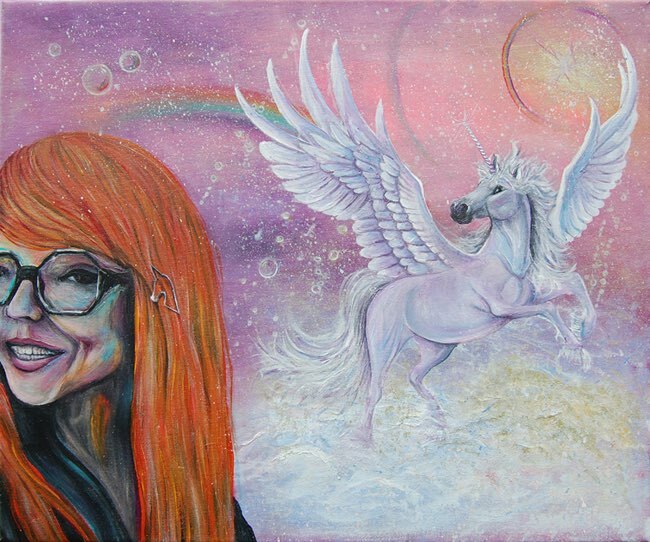 The portrait was based on a photograph posted by Kirsty in the weeks before she passed away, and in true Kirsty style it showed her beautiful, eccentric, colourful, whacky, fashionable and stylish side. You would never have known someone was as ill as she was as she smiled widely at the camera and looked as fabulous as ever! She was without a doubt the most positive and inspirational person I have known and touched so many people in this way. Kirsty loved anything unicorn related and the symbolism of the mythological creature is not lost on her, she was a truly magical being. Prints are available and all profits will be donated to the Cystic Fibrosis Trust and Live Life Give Life charities. Please help to raise awareness for Cystic Fibrosis and organ donation in Kirsty’s honour.